Services: branding, signage, social media. “I engaged Curious Design after unsuccessful preliminary meetings with two leading branding agencies left me with enormous quotes and no feeling that my vision was shared or even understood. Although I knew in my head exactly what my brand was about and how I wanted it to look, it became oddly vague when I tried to explain it. But Rachel and Marie got it. It was wonderful when initially explaining what my ideas were to have them so instantly recognised and endorsed. The Guilt Free Gourmet is a food company offering a range of delicious healthy meals. Aoife came to us looking for eye-catching fun feminine branding to help make their healthy meals feel decadent. We created a logo featuring the glamorous Guilt Free Gourmet character to appeal to Aoife’s target audience. 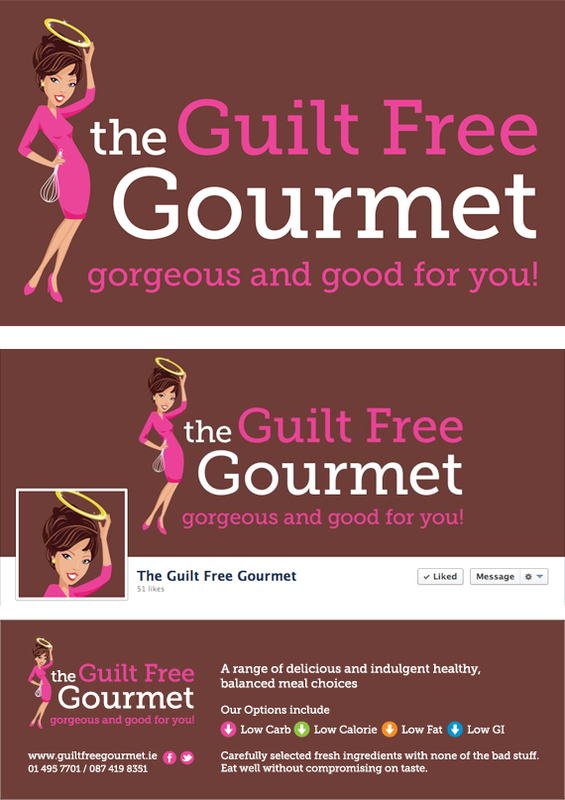 We also developed social media branding and signage for the Guilt Free Gourmet food stall.